Karuppasamy is called the Performer God because his commitment to the human beings is phenomenal. He is very harsh on negative forces or tendencies acting as a hindrance to your peaceful living. We have a series of Karuppasamy Remedies to help you attain the blessings and protection of the Lord. You can avail between individual or group package, both includes a fire ritual along with pooja and food feeding. We also have separate packages for only fire ritual or food feeding. Karuppasamy is a Performer God and He promises to help all those who seek justice. His commitment to the human beings is phenomenal. Feeding the poor pleases Karuppasamy the most. It is also considered the greatest charity of all charities. Participate in the food feeding ceremony to appease the God of Justice who in turn will guard you from the evils. Karuppasamy is a 'no nonsense' energy that cuts through all the blocks and gets the job done quickly! Participate in the Karuppasamy Group Rituals to reach out the compassionate God to do justice to you. A Group Fire Ritual will be performed to Karuppasamy at the AstroVed Fire Lab and Remedy Center in Chennai for Karuppasamy. 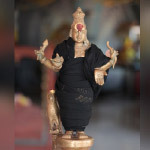 Pooja at His power spots will be performed and food feeding to 27 people will also be performed on the upcoming New Moon, or Full Moon or 8th Waning Moon. Karuppa Swamy is a powerful God endowed with immense wisdom and energy. He symbolizes the clouds, which empty their water on Earth and pave the way for clear skies, representing a happy and peaceful life. Deeply revered in rural areas, he is ever vigilant and stands as a guardian to the residents. Karuppasamy Homa A Fire Ritual will be performed at the AstroVed Fire Lab and Remedy Center in Chennai for Karuppasamy. This Archetype is a 'no nonsense' energy that cuts through all the blocks and gets the job done quickly!. Intensity Level 1 Ordinary Pooja Karuppasamy Rituals & Food Feeding for 25 people The Rituals to Karuppasamy will be done as per the Temple norms, which will include Archana, offering garland etc. Food feeding to 25 people will also be done as a part of the Intensity level 1 Ordinary pooja. 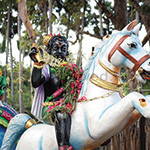 Karuppasamy is particularly active on New Moon days, Full Moon days and 8th Waning Moons. But one can call him anytime. Participate in the Individual Karuppasamy Rituals to break the negative influences acting as an interference in the way to peace and prosperity. An Individual Karuppasamy Fire Ritual will be performed at the Astroved Fire Lab and remedy center.